Cornus amomum, commonly called silky dogwood, is a native of eastern North America, from Georgia to Quebec, and west to Missouri and Iowa. This species is usually found in wetlands, along stream banks or swamp edges. In the Midwest, it can also be found in strip-mined sites. Its branches have a tendency to root in wet soil, creating thickets which are great for wildlife habitat. Autumn is a great time to see this deciduous shrub. Young silky dogwoods have bright red stems in the fall. Older plants have maroon to brown stems and twigs with salmon- colored piths year-round. In Cornell's Mundy Wildflower Garden, C. amomum’s plum-colored leaves contrast beautifully with the golden maple leaves now covering the ground. C. amomum has many interesting characteristics throughout the year. Young plants continue to have their bright red stems, with silky gray hairs, through the winter. In spring and summer, the silky dogwood wears medium-green, opposite leaves that can be silky gray underneath. The entire, 3-4 inch leaves are an important larval food for the Spring Azure butterfly. Cream white flowers, in two-inch wide flat-topped clusters, appear in late spring. In late summer, the silky dogwood bears blue or blue-and-cream spotted berry-like drupes that songbirds and gamebirds love. In maturity, this shrub can be 6’-12’ feet tall and wide, with spreading, multiple stems. Silky dogwood prefers partial shade and wet conditions, but can tolerate sun. It grows best in poorly drained, moderately acidic to neutral soils. This shrub can be used in streambank stabilization and as a screen or border. Silky dogwood transplants easily and will tolerate a broad range of conditions. To grow this plant from seed, sow the small brown seeds while the weather is still warm to allow the seeds to after-ripen. To propagate from cuttings, take softwood tip cuttings in early to midsummer, treat with 1000 to 2000 IBA, and leave in the rooting tray until spring, when they can be potted. The inner bark of silky dogwood can be mixed with tobacco to make kinnikinnik, the Native American word for herbal smoking mixture. Cornus amomum has no documented medicinal or food value. Other names for C. amomum are Swida amomum, willow dogwood, swamp dogwood, and silky cornel. 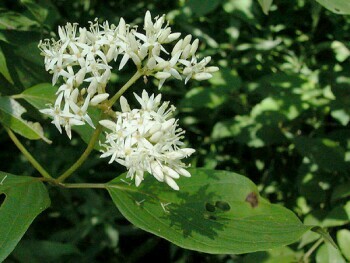 C. amomum is listed as endangered in Indiana. Cullina, W.( 2002) Native Trees, Shrubs, & Vines. Houghton Mifflin Co., NY. p. 284.
du Pont, E. N. (2004) Landscaping with Native Plants in the Middle-Atlantic Region. 2nd ed. Brandywine Conservancy, PA. pps. 58- 59. Flint, H. (1983) Landscape Plants for the Eastern North America. John Wiley & Sons, Inc., NY. pps. 123- 124. Foote, L. E. and Jones, S. B. Jr.(1989) Native Shrubs and Woody Vines of the Southeast: landscaping uses and identification. Timber Press, OR. p. 101. USDA, NRCS. (2005) The PLANTS Database, Version 3.5 (http://plants.usda.gov). Data compiled from various sources by Mark W. Skinner. National Plant Data Center, Baton Rouge, LA 70874-4490 USA.